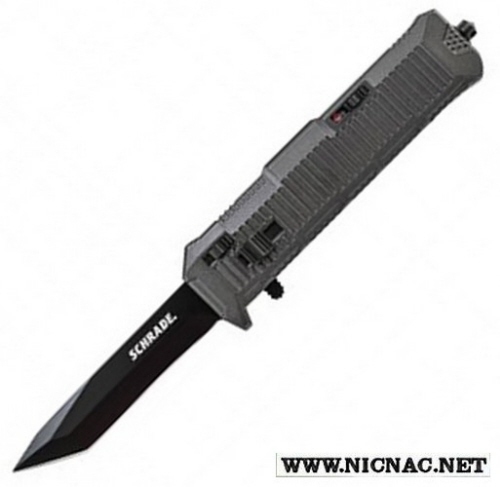 Schrade OTF (out the front) knife with a tanto point blade is lightning fast when opening. Overall open length of this automatic opening knife is 8.5 inches. The blade is a 3.75 AUS-8 high carbon stainless steel black finish and the handle is made from lightweight black aluminum. It comes with a glass breaker, safety and a removable tip-down pocket clip. In order to close the knife simply push the blade release forward and slide the bottom actuator back until it locks into place.